Singapore's corporate sector took a significant profit hit in a tumultuous 2015, with the business environment beset by domestic constraints, the plunging oil price and global economic slowdown. By yesterday afternoon, 332 listed companies had reported a combined profit of $25.58 billion for the full year ended Dec 31. This was 17.6 per cent lower than in 2014. A total of 240 companies have so far posted profits for 2015, and fewer than half of these - 104 - managed to grow their profits last year, compared with 2014. Annual profits for a further 107 companies were down year on year. 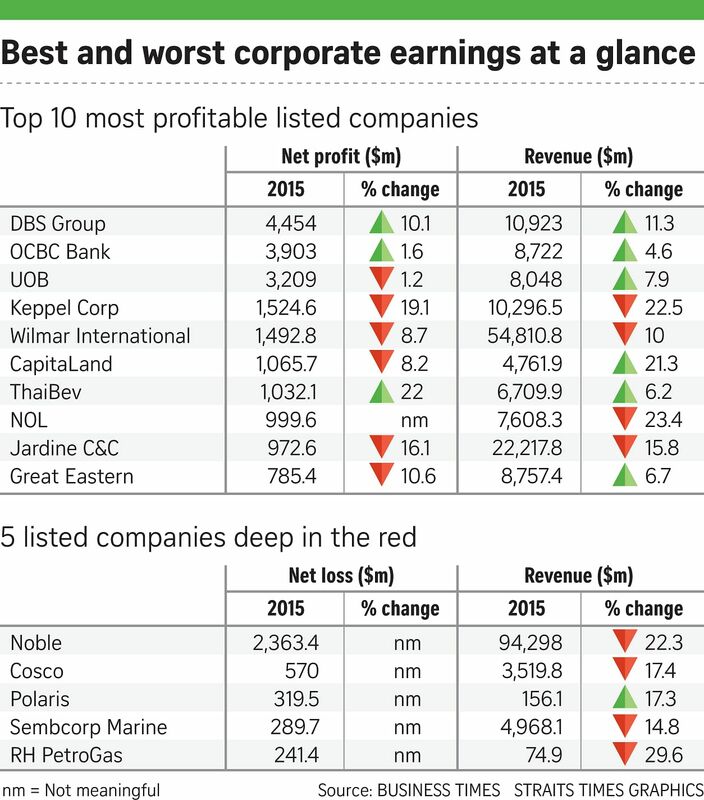 A total of 92 listed companies were hit by net losses last year. Among them, 17 companies saw their losses widen from a year earlier, while a total of 57 companies went from recording a profit in 2014 to suffering a loss in 2015. The tally so far reveals the challenging conditions of last year and an uneven outlook in 2016, OCBC economist Selena Ling told The Straits Times. "Banks were able to benefit from better interest margins but, elsewhere, manufacturing did poorly due to slowing external demand, the property sector was in the doldrums because of the cooling measures, and the oil and gas sector made news for all the wrong reasons," Ms Ling said. "This year, China remains a huge uncertainty for Singapore companies, not so much because of the headline growth but more for the policy-induced volatility. As for the oil and gas related sector, notice how all the talk of production cut has come up empty, and I expect still stormy waters ahead." Singapore banks were again the top three most profitable listed companies, with DBS Group taking the top spot after its 2015 profit grew 10.1 per cent to $4.45 billion. OCBC was in second place with a $3.9 billion profit, up 1.6 per cent, followed by United Overseas Bank in third spot even as its full-year profit slipped 1.2 per cent year-on-year to $3.21 billion. But the evergreen sector was not without vulnerability. The trio's loan book exposure to China and the oil and gas sector will persist if not deteriorate this year, and heavy provisions for the soured accounts will likely erode their earnings. The oil price woes had a more direct impact on Keppel Corp and Sembcorp Industries, both with substantial rigmaking businesses. Keppel Corp still posted $1.52 billion in profit last year - the fourth most profitable firm here - but that was 19.1 per cent lower than a year earlier. Sembcorp Industries' profit sank 31.5 per cent year on year to $548.9 million as its offshore marine unit and one of 2015's worst performers, Sembcorp Marine, suffered a $289.7 million net loss. Property giant CapitaLand reported $1.07 billion in net profit, down 8.2 per cent from 2014. Net profit for rival City Developments grew 0.5 per cent to $773.4 million. Industry watchers, including CDL chief executive Kwek Leng Beng, are hopeful the Government will unwind some property cooling measures this year. But the Monetary Authority of Singapore has repeatedly noted that the timing is not yet ripe for such a move. At the other end of the spectrum, Noble Group led the loss-making firms with a $2.36 billion net loss in 2015 - a steep fall from 2014's $186.6 million profit. Weak commodity prices and asset impairments have been crippling for the company, which had its credit rating further cut by Standard & Poor's yesterday. Several other energy and offshore marine players also ended 2015 with major losses, including Cosco, RH PetroGas, KS Energy and Pacc Offshore Services. Cosco suffered a $570 million loss last year, from a $20.9 million profit in 2014, while RH PetroGas saw its annual loss widen from 2014's $39.9 million to $241.4 million in 2015. Despite the choppy corporate landscape this year, there is some upside, Ms Ling said. "One bright spot is the growth in the United States. The data hasn't been fantastic but it offers some encouraging signs. "I think we can also expect the Government (to shift) its Budget focus back to economic growth with support measures for the corporate sector, particularly the small and medium enterprises."